The one given in a belly dancer's costume is a hip belt. In the Middle East women in parties will usually tie something around their hips before dancing (I have seen men do this as well). It is often a head scarf but a friend researching in Turkey once had a grandmother grab her jacket and tie it around her hips by the sleeves! In the twentieth century the simple sash began to be replaced by a more elaborate and decorated hip belt by professional dancers involved in nightclubs and films (influenced in part by the fantasy costumes of the ballet Russe which influenced the West's perception of the East for decades). These belts were form fitting and included beads, sequins and fringing. However, their downside was they had to be fitted to the dancer. With dancer tourism in the 1970s an off the shelf costume accessory was required. 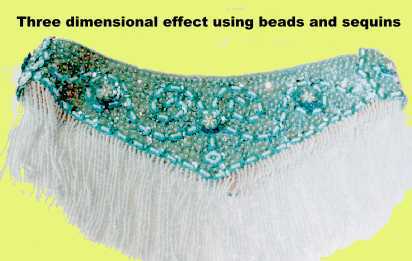 According to Morocco (MED List, 26 Sep 2002) this lead to the creation of hip wraps with coins and later the beaded hip scarf. In New Zealand the availability of imported costume accessories is fairly recent. Instead we tended to create our own costumes. Far from shoddy "homemades" many were works of art. The early hip belt tended to be made in two halves, sewn together on one side and fastened on the other. This section first appeared as "Hip Belt construction" in program 5 of BellyBeat. Top layer in costume colour. Beading is done through 3 or 4 layers. The bottom layer may be added after construction is complete to protect the stitching. Beeswax may also be applied to stop sweat soaking into the belt. Hand sewn with seed beads and sequins to make a three dimensional effect. The top is finished by couching bugle beads. 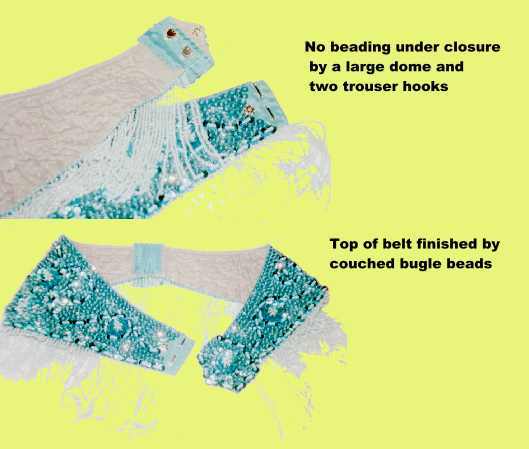 The fringing is hand threaded from glass seed beads onto a tape sewn into the belt. The closure has a large dome and two trouser hooks. Note there is no sequins or beads under the closure which makes a nice finish but means it is difficult to alter the size. For other ideas including wrap around belts and student belts.